Nirdosh increases metabolism, helping digestion and the removal of toxins from the chest and lungs. Nirdosh is based on an ancient Ayurvedic formula, which has withstood the test of time. All the herbs have a positive action on the lungs, digestive system and the mind. Nirdosh is soothing to the mind, helping to combat addiction. Many of the herbs are used in the kitchen giving Nirdosh a pleasant taste. Nirdosh is safe, smooth, tested by time and based on ancient philosophical wisdom. Nirdosh helps the body's defense mechanism against diseases - Nirosh is real rejuvenation, Nirosh acts beneficially on the whole system, especially gastrointestinal and respiratory systems on the gastrointestinal tract, where it relieves belching, bloating and constipation. It relieves symptoms of sinusitis and bronchitis. Inhaling smoke is a legitimate way of delivering therapeutic herbs into the system. The key for any medicinal use of herbs is correct dose and correct use. Excessive use may prove to be detrimental over time as abuse of any herbs or even food may cause damage over time. The formula of Nirdosh has herbs that work on the Kapha dosha. The lungs are a Kapha environment, they are cool and damp. Smoking increases heat and is drying. Nirdosh may be smoked therapeutically especially on cold wet days or to alleviate wet cough. Nirdosh improves agni, the digestive fire, which improves general health and immunity. Nirdosh calms the mind, alleviating anxiety and stress, pacifying the destructive force of excessive vata. Nirdosh lightens the body and mind providing clarity and happiness. Nirdosh can be smoked during the morning and early evening (Kapha times) for a balancing effect. Nirdosh is an excellent replacement for tobacco addiction and is safe. Dose varies according to season, time of day and individual suitability. Minimal and moderate use is always the safest way to administer herbs, however when attempting to reduce the addictions of tobacco it may be considered safe to smoke Nirdosh more frequently. 100% herbal ingredients - nothing artifical. 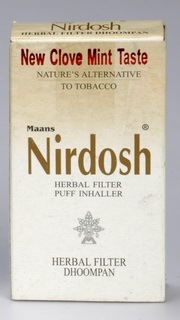 Nirdosh is truly a herbal product where each cigarette is hand made according to a 5000 year old Ayurvedic formula. 10 individual small boxes of Nirdosh, each containing 10 cigarettes. Fantastic! It cleans the respiratory system!